Senate Republicans had been secretive about their proposed health care bill, but on Thursday the wait was over. Their plan makes deep cuts to Medicaid, expanded under Obamacare to include more low-income Americans struggling to afford insurance, as well as doing away with tax increases to wealthier households and medical companies. In addition, the bill would end the individual mandate that created a tax penalty for those who do not get health insurance, as well as the requirement for larger companies to provide coverage to their employees. It would deliver a blow to many citizens, including those living with HIV/AIDS, whose access to life saving medications, as well as those preventing the transmission of the virus to others, depends in turn upon access to health insurance. McConnell did stress that the bill includes tax breaks, however, to help the poor purchase affordable coverage. “Obamacare is a direct attack on the middle class, and American families deserve better than its failing status quo,” Sen. Mitch McConnell said. Schumer charged that the Senate bill failed to match up to the president’s stated hope. The bill is being heavily criticized by not only politicians on the left, but many Americans for whom the issue couldn’t be more personal. 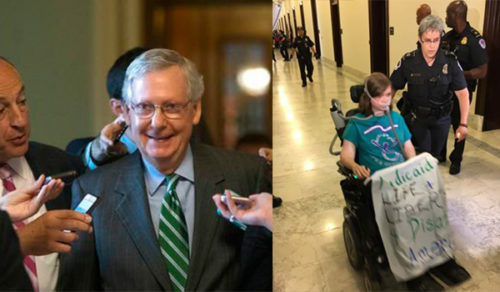 Capitol police forcibly removed protesters carrying out a “die-in” outside of McConnell’s office today, many in wheelchairs and identifying themselves as Medicaid recipients. Republican senators hope to vote on the bill before their July 4th recess. A vote is expected as soon as next week. The Congressional Budget Office is not expected to release a report on its expected effects until next week. McConnell said that after that point a “robust debate and amendment process” will go forward. Whether they can manage to gin up enough support in their ranks to get the bill passed remains questionable. Republicans representing more moderate districts have been facing angry crowds at town hall meetings and risk losing needed reelection votes if the repeal of Obamacare is too harsh. Meanwhile, those living in more solidly red regions, many of whom have been campaigning on the issue of repeal, are unlikely to come on board if the bill isn’t radical enough. Already four Republican Senators are saying they are against the bill in its current form, The Washington Post reports. They are Rand Paul of Kentucky, Ted Cruz of Texas, Ron Johnson of Wisconsin, and Mike Lee of Utah. They said in a joint statement that they are willing to negotiate changes that could win them over. In the end, McConnell has a difficult task ahead of him, in a matter that for many Americans is literally one of life or death.